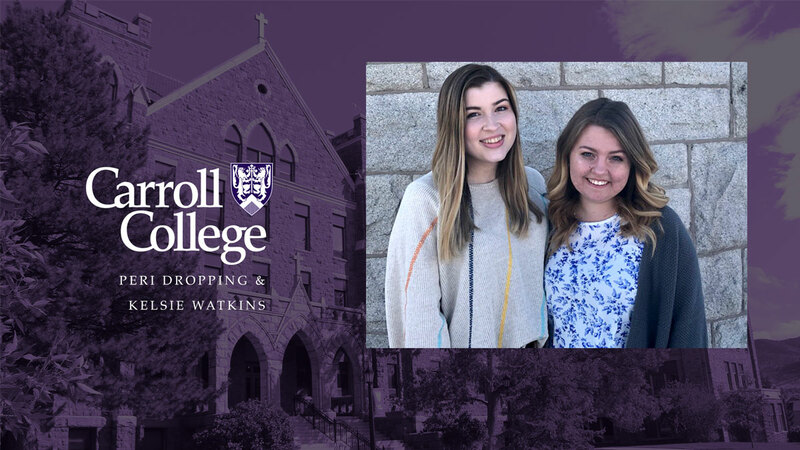 HELENA – Two Carroll College public relations majors have defeated nearly 100 teams from universities throughout the country to advance to the national finals in the Washington Media Scholars Foundation’s Media Plan Case Competition. Other finalists include Temple University, Ithaca College, Iowa State, BYU-Idaho, Anderson University and the University of South Carolina. Junior Peri Dropping of Redmond, Washington, and junior Kelsie Watkins, from Snohomish, Washington, both Public Relations and Communication majors, received word on Friday, March 29, that they had reached the finals. This recognition was the second in five days. As members of the Carroll College Talking Saints, Watkins and Dropping reached the semifinals of the Western United States BP debate championship on Monday. It had already been a good week, when the phone call came Friday morning. All six final teams receive all-expense paid trips to a seven-day media educational workshop and competition in the D.C. area in June that includes networking with top media companies, tours of the Washington Post and other D.C. media outlets, five days of academic and professional training in media planning and marketing, and the promise of ongoing mentoring after the conference for all six final teams. The Washington Media Scholars Foundation was founded by Robin Roberts, President of National Media Group, with support from major media companies including the Washington Post, Politico, Scripps Howard and ABC. The finals are held at the Newseum, a museum of journalism in Washington D.C., located on Pennsylvania Avenue between the Capitol and the White House. The winning team will receive $10,000 in scholarship funds, with $6,000 for the runner up. The foundation has awarded more than $500,000 in funds in the 10 years since it began in 2009. The competition required teams to develop a media plan and marketing strategy for the fictional opening of a new baseball park, including a campaign to win community support in an election to support the new ballpark. Watkins and Dropping developed a 10-page proposal including seven spreadsheets to show a month-by-month media spending plan that showed how many people in each demographic would be reached. They were not finished when spring break arrived. They also decided that coming in under budget would set their proposal apart. Watkins and Dropping sought out advice from media professionals, media buyers and PR consultants to learn everything they could about developing a media campaign. Recent Carroll PR graduates who work for top PR firms in the country have sent their congratulations. Both Dropping and Watkins see this conference as a chance to jumpstart their post-Carroll professional lives. They credit this success to their Carroll education.